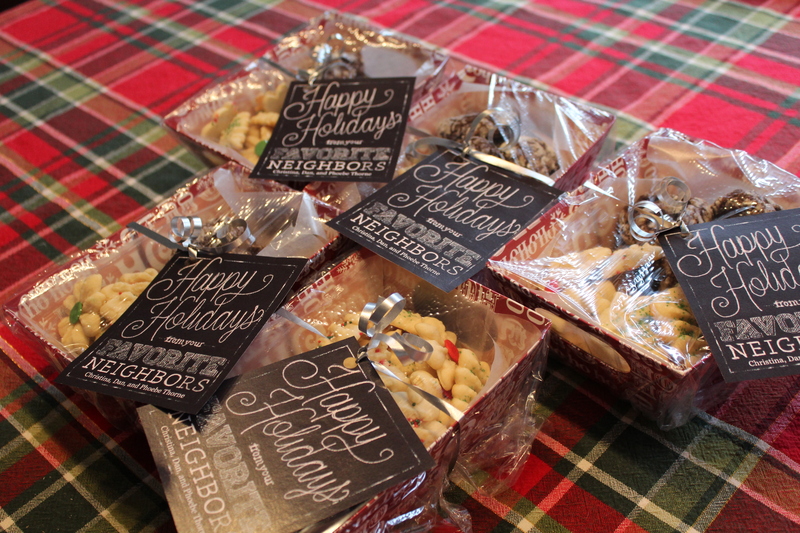 When we moved into our house last fall, one of our neighbors brought over cookies to welcome us to the neighborhood. Apparently, they had received cookies when they moved in a year or so before we did. The little girl in the family remembered that someone had done that for her, and when she saw Dan and I were the new kids on the block, she told her mother they had to bake for us. They gave us the cutest batch of cookies that had clearly been baked for us by the kiddos themselves. During last winter’s horrible, never-ending snow, Dan got up early and shoveled our driveway every morning that it snowed overnight, which was pretty much every night. One day, a neighbor noticed Dan and brought over his huge snowblower. He made short work of clearing that driveway. While my dad was over last summer supervising some contractors, a neighbor came over to introduce herself. She told him where she lived and to let us know that if we ever needed a tool, her husband had everything. Since then, we’ve borrowed a ladder and a wheelbarrow on more than one occasion. Before we got our small victory garden going, and way before we had a completely functional kitchen, our neighbor would bring over tomatoes and dill from her garden. If we weren’t home, she’d leave it on our back patio table. She’d even rush to give tomatoes to my mother-in-law, who was outside doing some yard work, to make sure her homegrown veggies got to us. I grew up in the city. My family has lived on the same street for over 30 years, and I can probably name only one or two other people who live on the block. We kept to ourselves then, and Dan and I did the same when we moved into our first apartment together in Roscoe Village. In fact, I intended to remain fairly anonymous to our neighbors once we moved to the suburbs. But as you can see, our neighbors’ kindness shone through from the moment the moving truck pulled into our driveway. To repay even a small fraction of that kindness we were given, Dan and I decided to bake cookies and bring them around to our neighbors as a small Christmas sign of thanks. I found the cute red Ho Ho Ho boxes as the Dollar Tree, and the gift tags are adorable printables from here. You can even type in your own name without using Photoshop! You can’t see the cookies very well, but I made classic spritz cookies (I love that spritz gun! ), and chocolate crinkle cookies. If you do make edible treats for the neighbors, I always make sure to include a small description of any ingredients that people are most commonly allergic to, like wheat, chocolate, dairy, eggs, etc. We delivered all but one gift today, and the smiles of our neighbors when they opened the door and saw us was what the Christmas spirit is all about.